﻿﻿﻿﻿﻿ We recommend a few home remedies to keep on hand when dealing with new puppies. Aspirin (Acetylsalicylic Acid) can safely be used in puppies for pain or discomfort. We recommend it for pups that get sore from recent vaccine injections or injury. It is given at a dose of 5-10 milligrams per pound. For example, a 5 lb. puppy needs 25-50 mg aspirin. Since children's (or low strength) aspirin are 81 mg tablets, a 1/2 tablet would be an adequate dose for a 5 lb. puppy. We usually recommend giving it with food for less potential stomach irritation. It can be repeated at 12-hour intervals if needed. Karo Syrup or Pancake Syrup, either syrup can be used to help increase the blood sugar in a weak puppy that has not been eating well. Even though an adult dog can fast itself for days and maintain a good blood sugar (glucose) level, young pups under 4 months of age do not yet have the ability to do this. The most effective way to give syrup is to wipe it along the gum line every 15-30 minutes in a very small amount. If the puppy is very sleepy, they may not be swallowing well and larger amounts may accidentally be inhaled and lead to pneumonia. The pup can be kept warm with lots of gentle cuddling, or a heating pad covered in 2 layers of towel and set on low. 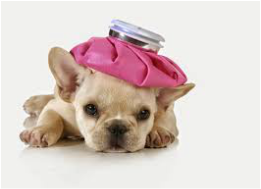 If the puppy is not improving, contact McMillan Veterinary Clinic for an appointment.